Proper vitamin and mineral supplementation is critical for children for a number of reasons. Children between the ages of 2-12 develop rapidly, and need all of the proper nutrients to support their continuing development. Kid's Toddy provides your growing child with a full spectrum of nutrients, including vitamins, minerals, amino acids and phytonutrients. Specifically formulated for children ages 2-12, Kid's Toddy provides the essential nutrients to support their development. What Makes Kid's Toddy Different? Kid's Toddy provides your growing child with a full spectrum of nutrients, including vitamins, minerals, amino acids and phytonutrients. Specifically formulated for children ages 2-12. 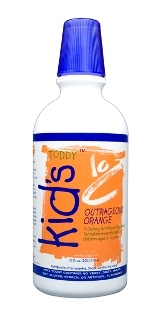 Kid's Toddy provides the essential nutrients to support their development. CAUTION: Children should not use more than 10,000 IU per day of supplemental Vitamin A except under the advice of a physician. Keep this and all dietary supplements out of reach of children. ** Phytonutrients include Broccoli, Carrot, Sweet Corn, Spinach, Tomato, Banana, Blueberry, Cherry and Peach. These statements have not been evaluated by the Food & Drug Administration. This product is not intended to diagnose, treat cure or prevent any disease. Kid's Toddy is a trade mark of SupraLife International.